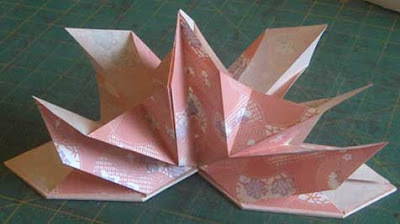 I prepared a guest tutorial for the Sixth&Elm blog, showing how to make an Origami water lily. Now I have a new tutorial ready showing how to make a book using those water lilies. Before starting this tutorial, you need to make three water lilies, all the same size, using the "Origami Water Lily Tutorial" first. You'll need some Origami paper to make the water lilies, or any other nice lightweight Japanese paper like the pretty pink paper used in this tutorial. So, go make 3 water lilies, then come back. When the three water lilies are finished, attach them to each other, back-to-back. Place one flattened lily in front of you. Apply paste to the flat surface of the lily and stack the second flattened lily on top – make sure to align them so the lilies both open at the same end. Apply glue to the surface of the second lily and stack the third lily on top. When they are all attached, they should open up like the first picture below. The point where the three lilies meet is the spine of the book. To give it some stability, cut a short and narrow strip of paper and paste it over the spine. Use paper that is the same as the liles or similar in colour to keep it unobtrusive. Now the text block is finished and the covers can be made. Cut two covers, the same size and shape as the flattened text block. Use binder's board or heavy cardstock. Also cut two pieces of decorative paper for covering the binder's board. These pieces of paper should be the same shape as the binder's board, but about 10mm wider all the way around. Cover both boards as you would for any other book. If you've never done such a thing before, follow the next few steps. Once you have the decorative papers cut out, brush paste over the entire surface of the binder's board. Lay the binder's board paste-side-down onto the back of the decorative paper. 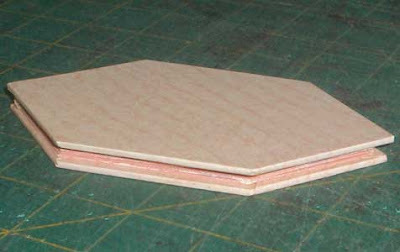 The edges of the decorative paper need to be turned in to cover the sides of the board, so start with the two longest edges. Bush paste onto the paper on each side then fold it over the edges. 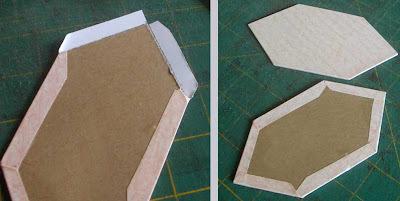 Cut notches in the paper at each corner. 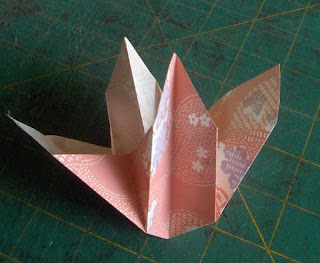 Apply paste to the paper and then fold it over. Cutting the notches first will help the paper lie flat and make neat corners. When both covers are done, it's a good idea to press them under a weight for a while, perhaps over night, to let the paste dry. Now the lily-textblock just has to be attached to the covers. Place the flattened lily-textblock in front of you, and brush paste onto the flat surface – don't get any glue on the other parts of the lilies because you don't want them to get stuck together. Place the paste-side of the lilies onto the back of one of the covers. Then brush paste over the other side of the lily-textblock and stack the second cover on top. The whole thing should be pressed under a weight until the paste is dry. This will do two things: it will consolidate the bond between each of the pasted surfaces and it will prevent the covers from warping. This one I will definitely try. Thanks, Rhonda. I love this, thank you. I work at a youth center...can't wait to show the kids.